This refreshing, hearty salad is good with grilled steak or chicken, or on its own as a light lunch. You can prepare the ingredients ahead of time, but do not assemble until just before serving to keep the bread crisp and crunchy. Preheat oven to 375 degrees. Pour 1/4 cup olive oil on a flat plate. Dip each slice of bread into the oil to coat both sides and place slices on a cookie sheet. (Add more olive oil to the plate as needed.) Toast in the oven for about 10 to 15 minutes, until nicely browned. When the slices have cooled a bit, cut each slice into cubes. 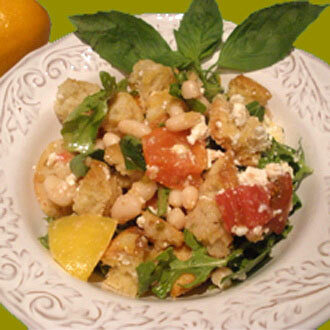 In a large salad bowl, toss the bread, chopped tomatoes, arugula, beans, and basil with the lemon juice. Add the feta cheese and salt and pepper to taste. If needed, add some more olive oil.